The New York Times bestseller 90 Minutes in Heaven is now available with an inspiring video curriculum. This seven-week Bible study on the subject of heaven was created specifically for small groups or a church-wide campaign. Based on Don Piper's incredible true story and recorded by Piper himself, this DVD curriculum will encourage participants to discover the wonder and joy they can have as they live with the expectation of the place God has prepared for them. The seven weeks of the study address the questions: When we die, do we enter heaven in the next instant? Does God still work in miraculous ways? Who will be in heaven? What is heaven like? Are angels real? Does heaven change anything about our lives now? Why are we here and should we be longing for heaven? Churches of all sizes, small groups, Bible study groups, and even therapy groups will find this thought-provoking material helps their members see life's troubles in a whole new light. 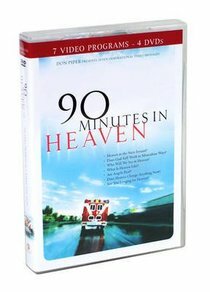 About "90 Minutes in Heaven (Dvd)"